A three storey building designed by Blackwood & Jury in 1912. 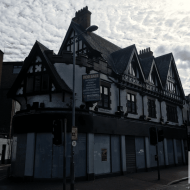 The building was a replacement of an earlier public house (c.1895) and is recorded as being leased by Mr William T. Braithwaite from the Representatives of Dr Magee and Mr Samuel Tate. On completion the ground floor comprised a bar and two shop units and the upper floors were occupied by offices and living accommodation. The bar was fitted out with oak fixtures and the external ground floor walls were finished in a decorative faience material. The Belfast Banking Company Ltd had acquired the building by 1919 and opened a bank branch with manager’s house above. The Belfast Bank merged into the Northern Bank in 1970 and the branch continued to operated. The building was B2 listed in April 1994. By the early 21st century the building was occupied by a branch of Alliance & Leicester until rebranding to Santander bank during early 2011. The Santander branch closed on 31 May 2018. 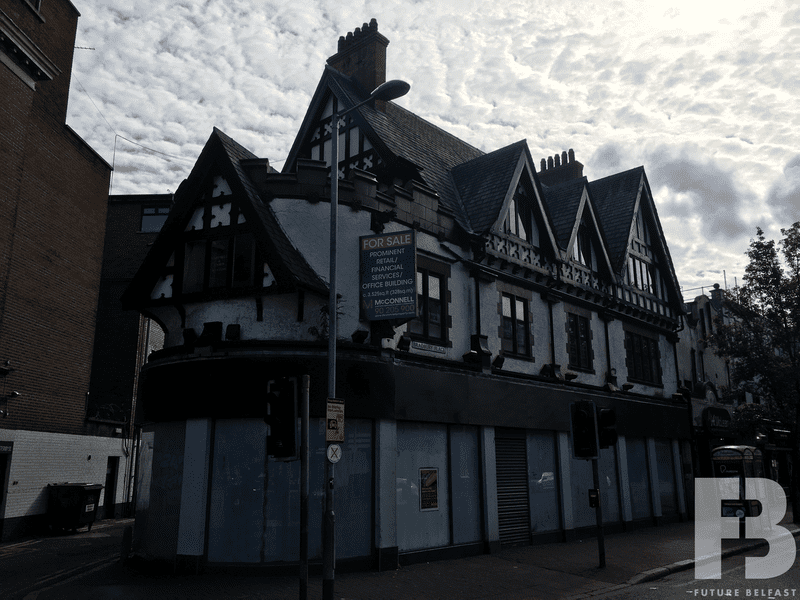 McConnell Chartered Surveyor’s placed the building on the market in September 2018 with offers invited over £350,000. The building was ‘sale agreed’ by November 2018. Varsity Estates submitted an application (LA04/2019/0047/LBC) in January 2019 proposing to remove non-original internal walls dating from the 1950s.